It’s a full three months since I completed the one-a-day project. It’s been a hectic thirteen weeks since it finished, with life and work intruding too many times on the important business of photography. I’ve had little time to reflect on it, or do anything else photographic, come to that. Now, however, I think it’s about time I took stock of what I learned over the 366 days of the project. Initially, the idea was simply to compel me to spend more time on photography. The project was to provide a perpetual reason to take a photograph – not just to photograph events and scenes when the thought occurred to me. I’d seen many daily photography blogs on the web – some good, some even inspirational and plenty of others not quite so good. However, all those photographers were out there, every day taking pictures and I, despite professing to be a photography enthusiast, was lucky to take a photo (that wasn’t of a pub) more than once a week. Additionally, I knew that using cameras more regularly would improve my technique and technical understanding – practice makes perfect, as they say. The rules were simple. I was to take at least one photo everyday, using whatever equipment was to hand and to post an image in a daily gallery on the web. One daily photo and one photo only, posted on the internet for anyone to see. I added one further rule and this is where my daily blog differed from most others, I would not be permitted to process the image in any way – other than to reduce size of the image to fit it on the page. No cropping, straightening, equalising, dodging, burning, colourising. No modification, at all, of any image – the photo was to be published as it came out of the camera. Obviously, panoramas were stitched and Polaroids were scanned, but no further enhancements were made to any image. This was to require me to pay a good deal more attention at the point of taking the photo, to avoid the “I’ll fix it in Photoshop” attitude. Effectively, to treat it in much the same way we used to, in the days of film, paper and chemicals. To get things started, I took a look through my Lightroom database, to find a contiguous series of photographs, working backwards, from the day I’d decided to start the project, early in March 2010. This would provide me with a datum point, a baseline. These photographs were not taken as part of the project, they pre-dated it, therefore they would enable me to see if the quality of my work did indeed improve over the year. Working backwards, the first day without a photo was 5 March 2010, so the first photo of the project one taken on the 6th – my mother’s (and Michaelangelo’s) birthday. I had only a three-day sequence to start the project off with – as I said earlier, I was not taking photos very often. I selected one image for each of the three days and posted them in a gallery. The following day was the first real working day of the project, it was the first time I woke up in the morning thinking “what’s today’s photo going to be?”. This was new. I work from home, most of the time and my work keeps me in front of computer screens for long hours at a stretch. Unless I made an effort to get out of the house, the one-day-day project was going to end up being a series of banal domestic scenes, with a photo from the odd trip out, every now and then, unless I made an effort. Not a great start to the project, but I guess that’s part of the challenge. Over the next few days and weeks, a process started to develop and a few ideas began to gel. Every day, I had set myself the task of choosing what to photograph for the project. What did I plan to do that day? When would a likely photographic opportunity present itself? After a few days of this, I realised the project was fast becoming a photographic diary. A visual journal, if you like, albeit a constrained one. This was to become the primary theme of the project. I also gave every photograph a title, something else that was new to me. I hadn’t planned to do it, in fact I had never, ever given any photo a title until I stared publishing the one-a-day images. Originally, I had intended to caption the photos, to offe a little explanation, but, after captioning a few images, I felt the pages looked unwieldy and inelegant. So tried giving each each image a title – this felt much more satisfactory so I stuck with it. Retrospectively titling the images I had shot before. I didn’t want the title to be too descriptive, the focus was primarily on the images, but a few words – preferably a single word – seemed to me to provide a little background information and sometimes an ironic counterpoint to the subject of the image. And it’s quite a fun thing to do. Choosing a day’s image was not always easy. Quite often, it was not the best photo of the day from an aesthetic or technical standpoint, it was frequently the day’s most apposite image from an emotional perspective. A picture that summed up mood of the day or an image that expressed a particular emotion or recorded an important aspect of a day. Sometimes, the choice was very easy – only one photo was taken that day. But, on the days where there were a lot of images to choose from – for example when I was out on a shoot, I found I frequently chose an image that was not actually part of the shoot. I used a variety of cameras through the year, initially I used the Canon G9 more than any other. It’s a great camera and it produces excellent results in a compact, portable package. But the problem for me was I could not clearly see the screen to compose a photo. Thanks to my aging eyesight, I need glasses for close-up work, but wearing glasses means you can’t view the scene you are photographing. The built-in viewfinder in the G9 is close to useless, even though it has dioptre correction. But it’s tiny, inaccurate and easily blocked by fingers, filters etc. So I tried to use the screen, but I often returned with images that were just that little bit off, slightly skewed or they contained something I could have avoided, if I could have seen it. Very frustrating. The Nikon D5000, solved the screen viewing issue, as it’s an SLR, but it’s bulky and I had issues with the 20mm prime lens I wanted to use with it – I thought there was a lot of distortion, chromatic aberration and it was soft at the corners. I even sent it back to Nikon to get it checked out, but it passed their tests. DxO Labs eventually released a module that fixed the D5000/2omm F2.8 combo, but that came out about the time I finished the project. Things changed in early December 2010, when I got the Leica D-Lux 5, along with an accessory electronic viewfinder. I had considered getting a Panasonic GF-1, but the shortest (and smallest) lens at the time was the 20mm pancake lens (40mm equivalent), which was just not wide enough for me) and the complete outfit is not very pocketable. The Leica easily fits in a jacket pocket, it has all the right controls and with the EVF (the Panasonic one, as it’s almost half the price of the Leica and is exactly the same), I can see what I’m taking photos of and read the technical info. Yes, I know the Panasonic DMC LX-5 is a good £200 cheaper than the D-Lux 5. However, with the Leica there’s no grip on the front (it fits smoothly in your pocket), the interface is much simpler and you get a full licence for Adobe Lightroom. I also found out from DxO labs that, despite what’s said in the photography blogs, the RAW files are not the same as RAW files from the Panasonic, even though they use the same lens and sensor – and Leica’s hi-def JPEGs are outstanding for a camera of its size. What I found, though, using all of the cameras, was quickly I got used to how they worked and how they rendered scenes. I became familiar with their strengths and weaknesses and occasionally found myself wishing I’d brought along a different camera, when I felt that might have captured a better image. Although I wasn’t too inexperienced with any of them, I found continuous, regular usage made a huge difference and with that familiarity came the opportunity to concentrate more on the image, than the equipment. 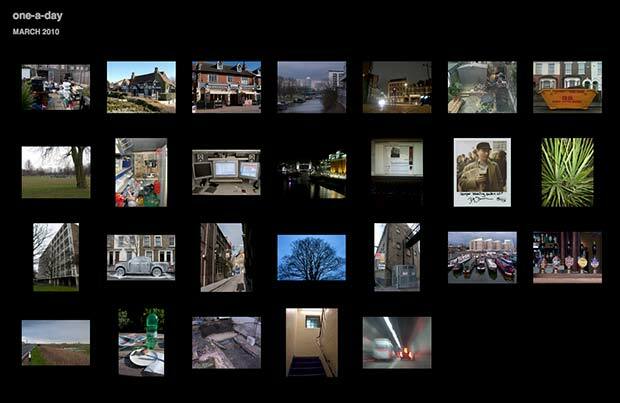 Towards the end of 2010, as the site grew in size, I realised that the web was probably not the best medium to use to present the project and a photobook might actually be more appropriate. On the web, you only see one page at a time, you get no sense of scope or context. Index pages of thumbnails, don’t provide a sense of perspective and the tactile nature of reading provides an added dimension. So I decided to produce a book, to end up with a more tangible outcome for the project. I settled on a basic book design pretty quickly, but refining it took a while. I was still modifying the layout as I was building the book and using the Blurb software, which was not really designed to produce a 400 page document, meant any design tweaks were painstakingly reapplied. There were lots of issues to consider during production – supporting text, cover image, size, format, paper quality and binding, some problems easier to fix than others. If you don’t have a lot of cash, you’re not in the position to order a lot of proof copies, before committing to a final design, so you attempt to get it right first time, inevitably, though, there are some things that could be improved. Overall, however, I’m pretty pleased with the result, it looks pretty much as I envisaged it would appear, the one surprise being how much more personal the project felt in book form, than it did on the web. Has it made me a better photographer? I believe so. It is not simply that my technical proficiency has improved, my approach has changed. Having to think harder about the intent of any photograph has forced that change. Sometimes, the decision was simply to snap and see what came out of the camera, but even that was a more conscious decision than previously was the case. Through the project, I have become much more aware of the decision making process and that has changed how I take pictures. The technical issues are important, extremely important, but it’s ideas and approach that matter the most.